Simple plug-and play keyboard and mouse with reliable wireless connection up to 10m / 33ft away, sharing one tiny USB receiver (128-bit AES encryption between devices and receiver). No hassle with pairing or software installation. 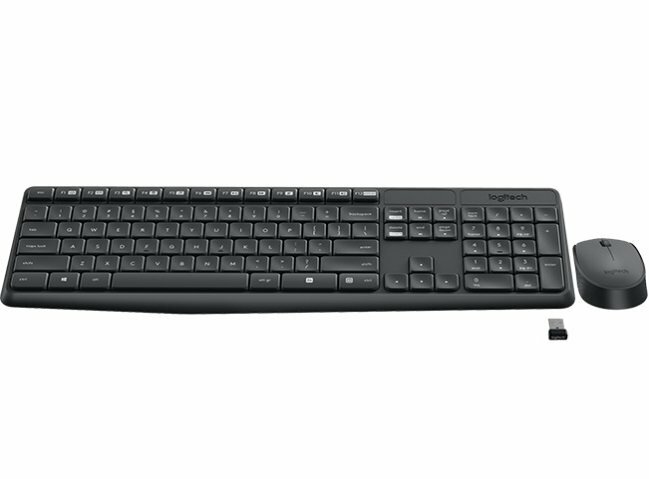 Type comfortably on a familiar keyboard layout with full-size arrow keys, number pad and easy access to 15 shortcut-keys. Enjoy long-lasting battery life – 36-month for keyboard and 12-month for mouse. With its durable construction, its spill-proof design*, anti-fading treatment on each key and sturdy tilt legs, it is built to last. •	1 AA battery for mouse and user documentation. Where can I find my wireless USB receiver? The wireless USB receiver for the MK235 bundle is located on one of the exterior box flaps as you first open up your product.